Parkinson’s disease, an illness that most commonly affects senior citizens, is a disease of the nervous system that influences how the brain controls the body. What usually starts off as tremors in the hand often leads to muscles becoming rigid and affects everyday living, from walking to talking. While there is currently no cure for Parkinson’s, there are ways to help manage the disease – one of which is exercising regularly. The exercise doesn’t have to be the typical walking on a treadmill or doing sit-ups. While those exercises are good, there are engaging, fun exercise routines for Parkinson’s patients to practice that will place them on the path to their best health. For example, Westside Garden Plaza in Indianapolis, Indiana, is helping patients punch out Parkinson’s – literally. Its Rock Steady Boxing program is an exercise class in which participants go around a circuit and practice their boxing skills. The class starts off with get-to-know you questions and/or inspirational quotes to build the relationships among those who attend. Then, after doing warmup exercises to stimulate blood flow, the group reviews punches and footwork before they go around to different stations. The three-minute long stations vary from heavy bag combinations, speed bag combinations, hand-eye stations, a NuStep® station (a workout machine designed to allow low-impact, full body workouts) and more. After eight to 10 rounds, the class ends with a cool-down routine. And participants are seeing results roll out through Rock Steady’s routines! Participants have found that the exercises improve endurance, posture, ease of getting up and down from a chair, coordination, flexibility, muscle strength, stamina, dexterity…the list could go on! Not only does exercise help those with Parkinson’s in their physical fight, but it helps them knock out mental blocks, as well. The classes empower participants to regain control over not just their bodies, but their lives. The satisfaction of working hard in the class is encouraging and the inspiration to get up and take care of oneself is empowering. The satisfaction beats the struggle every time. Spiritually, exercising allows the participants to have faith to overcome obstacles and hold on to hope – and the peace and purpose that brings makes the class rewarding enough in itself. 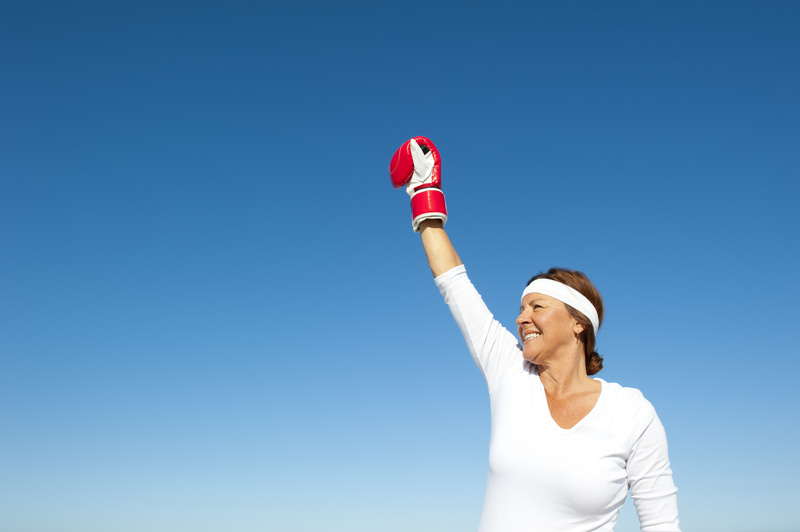 Boxing isn’t the only type of exercise that brings relief to those with Parkinson’s disease. Westside Garden Plaza also offers a program called “The Climb” that allows participants to work at their own fitness levels depending on their current fitness ability. The classes aim to be enjoyable, always starting off with a fun joke. The class then warms up with gentle yoga and tai chi before beginning exercises, such as posture therapy and muscular reeducation, that fight the deficits of the disease. The exercises can be done in both standing and sitting positions to accommodate all participants. Some of the exercises use yoga blocks to build leg strength and improve the ability of the exerciser to get in and out of cars, up and down from toilets and chairs and movements up and down the stairs. Other exercises at “The Climb” use PVC pipes to target thoracic stability, upper-body strength and leg strength. Cool-down includes voice activation exercises since softer speech/voice is one of the areas often affected by Parkinson’s. Whether one is looking for fast-paced action and wants to be like Muhammad Ali or desires a more laid-back exercise routine, there are many ways Parkinson’s patients can take action to improve their well-being. The case for exercise is there, and many Parkinson’s patients are battling to be their best selves and stay healthy.